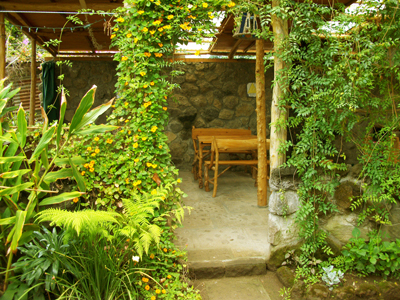 Located in the heart of 'the zona viva' San Pedro La Laguna, 100 meters from Lake Atitlan (one of the most beautiful lakes in the world) and out of the flood zones. This unique restaurant is nestled in a lush garden of flowers and exotic trees. This place is a dream come true to anyone looking for a successful business in a tropical paradise. The restaurant can accommodate more than 60 people, over 350 m².50 seats under various shelters and a rustic stone chimney for the fresh nights. The rest of the tables are romantically scattered in the garden. Open from 11am to 10:30 p.m. we offer since 2006 a French fine cuisine (gastronomical) as well as pastas and pizzas. All our products are fresh and processed by our care. 7 years of dedication and passion have made us an excellent local reputation. Our customers are national as much as international. We are present in several guidebooks. Concerned by the ecology, our waste water treatment system is unique, we provide organic and our furniture has been designed by us with the trees we cut. The restaurant offers many exhibitions of paintings, photos and crafts. Musical entertainments, often by a dedicated group at the restaurant are proposed on weekends, even every day during the high season. Staff: 7 employees + owners. Sells cause of medical problems. Great potential. The perfect business for a couple.